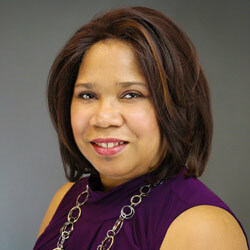 Tanya White-Earnest is an HR Training and Development Consultant for Trident. She has over 20 years’ experience in career development serving civilians, veterans, and military in transition. Tanya is a certified TAP Facilitator and created a TAP Supplemental Transition Workshop series, for which she secured a contract with the DOD and DOL at Scott AFB to support thousands of transitioning military members, from all branches and at all levels of the services, and their spouses. A former Air Force spouse, Tanya created, implemented and facilitated the first set of Transition Workshops for the Kadena AB Family Support Center, including curriculum and supplemental workbook that served several hundred separating military members and their spouses. Tanya wrote a highly regarded career development and advice column for St. Louis American Newspaper for three years. She led the creation, curriculum development, implementation, and facilitation of Transforming Your Worklife, a 40-hour career development workshop for St. Louis Community College and St. Louis Agency on Training and Employment. She provided outplacement support to major companies such as Bank of America, American Airlines, and Nestle; and assisted over 2,000 veterans and civilians in job search and career development in a variety of industries. Tanya holds degrees in Communications and Education (Workforce Education, Training and Development) and completed her Master of Science in Education degree in 2014 at Capella University.